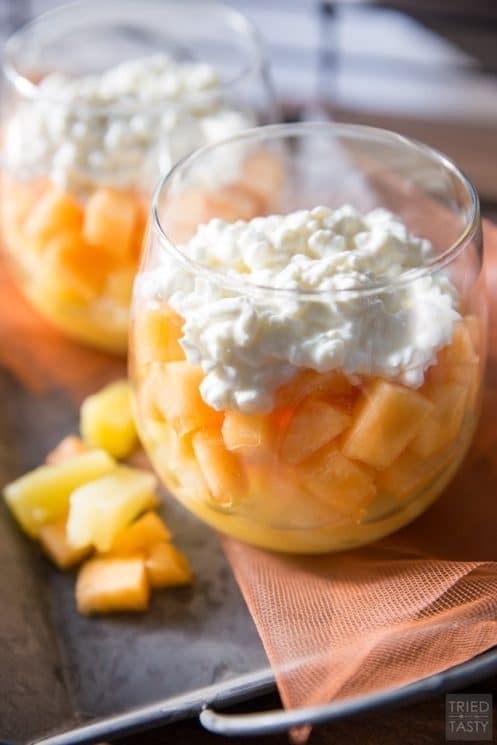 Delicious twist on a fall classic, the Healthy Candy Corn Parfait! Hey ya’ll it’s Yvonne again once more from Tried and Tasty! It’s the end of September which means we are heading in to Fall. Fall means Halloween. Unfortunately Halloween carries with it the connotation of all things sugary sweet & unhealthy delicious. Let’s get to know each other a little more shall we? Growing up, my family actually never celebrated Halloween. We’d occasionally go to ‘harvest’ parties at church but generally we didn’t do anything. I’ve never been trick or treating and I didn’t start dressing up for the holiday until after I’d moved out on my own and would dress up for work or get togethers with friends. Many would say that I was deprived, but I like to think of it as my parents saving money on their dentist bill! Don’t get me wrong, I LOVE a good indulgence.. for breakfast, lunch, dinner, dessert, or snack. My waistline however: doesn’t. 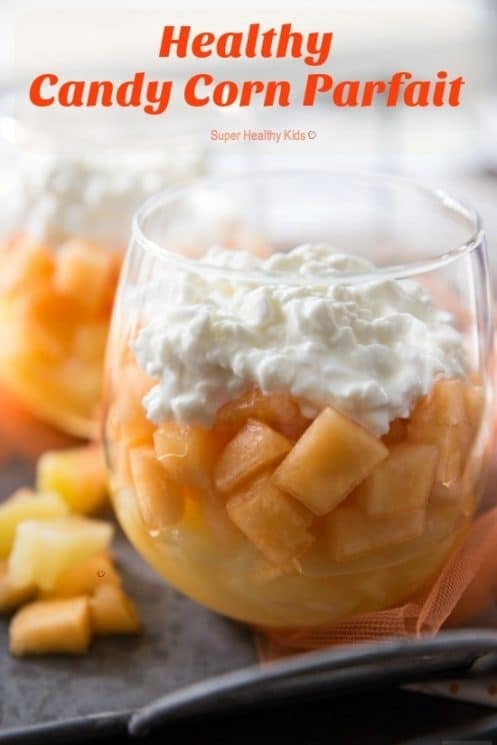 What I love about this festive Healthy Candy Corn Parfait is it’s good enough to have even for breakfast! Especially great for a snack, and equally as wonderful for dessert. Pretty much if I were you I wouldn’t want to touch that candy with a 10 foot pole (my dear Grandmother used to always use that phrase, I think of her every time I say it and smile!). But in all seriousness: don’t. Just don’t. 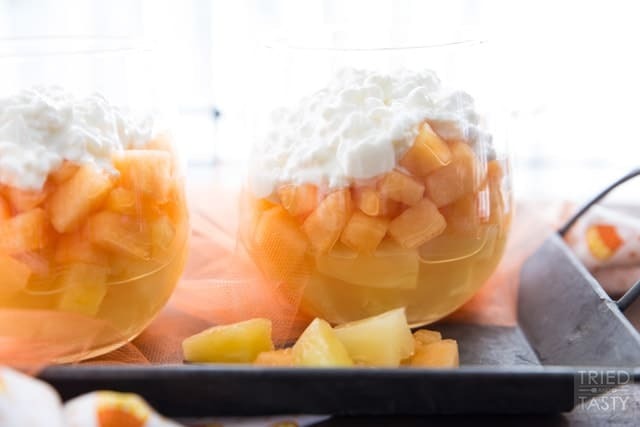 INSTEAD I bring you a super delicious twist on the ‘ole candy corn phenomenon! 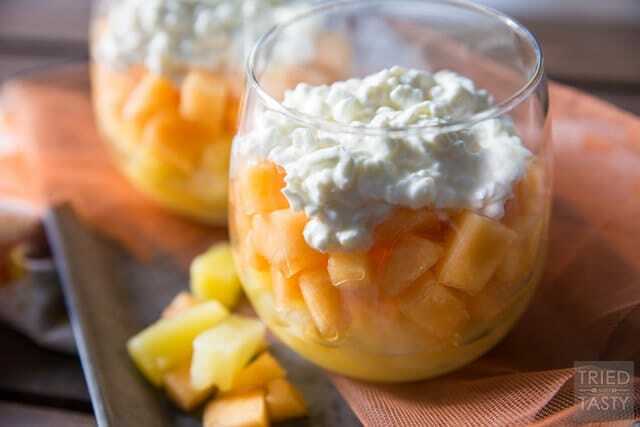 Three ingredients: pineapple, cantaloupe, cottage cheese. Yes, yes and SO much yes! You can add this to your holiday party and not feel an ounce of guilt serving it to your guests! 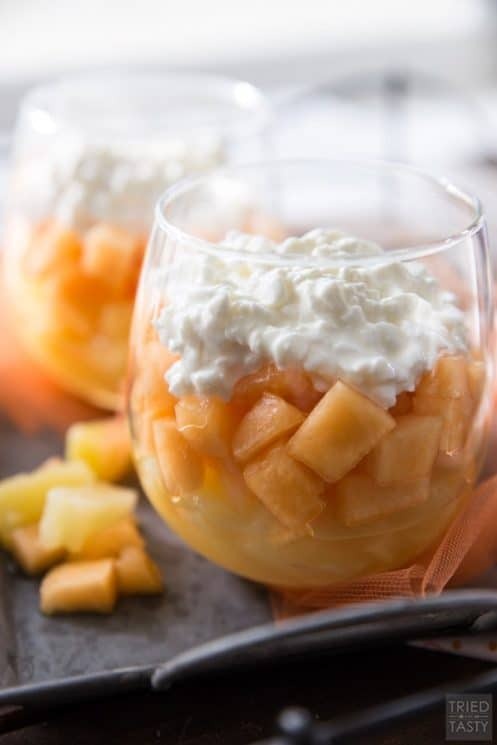 Serve in a nice and elegant glass. Here are some benefits (that I found in my research: here) of pineapple. Did you know that according to the FDA, pineapple contains 1/2 of the daily-recommended value of vitamin C? The fruit also contains nearly 75 percent of the daily-recommended value of the mineral manganese, which is essential in developing strong bones and connective tissue! Interestingly enough, pineapples can help reduce the risk of macular degeneration (which is a disease that affects the eyes as people age) due in part to its high amount of vitamin C and the antioxidants it contains. Additionally, like many other fruits and vegetables, pineapple contains dietary fiber, which is essential in keeping you regular and in keeping your intestines healthy! Woot woo! Here are some benefits (that I found in my research: here) of cantaloupe. 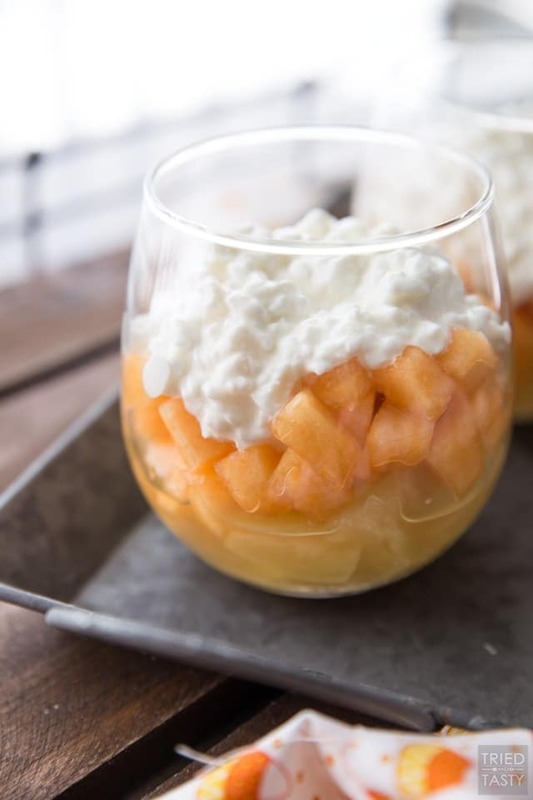 The high water content of cantaloupe helps ward off dehydration and combat the heat while their cool & refreshing taste provides a guilt-free, low maintenance dessert for both kids and adults alike. 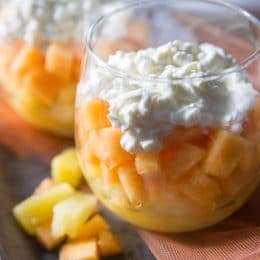 You may be surprised to learn that the antioxidant zeaxanthin, found in cantaloupe, filters out harmful blue light rays and is thought to play a protective role in eye health and possibly ward off damage from macular degeneration (paired with the pineapple you’ve got a match made in heaven! The fiber, potassium, vitamin C and choline content in cantaloupe all support heart health. Here are some benefits (that I found in my research: here) of cottage cheese. Check out this superstar line-up of benefits! The health benefits of cottage cheese include weight loss, a good supply of protein, B complex vitamins and healthy fats, and a reduced risk of breast cancer. Not only that, but cottage cheese is also a good source of various minerals such as calcium, magnesium, potassium, phosphorous, zinc, and selenium which all play vital roles in many of the body functions. Some trace elements found in cottage cheese include calcium, iron, magnesium, phosphorous, potassium, sodium, selenium, and zinc. Holy moly! With the trio combined, you MUST make this! Heck, you can make it all year round if you’d like – your body certainly won’t mind! When she’s not at work or spending time with family or friends, chances are you’ll find Yvonne in the kitchen wearing an apron and a smile. In a small glass, layer pineapple first, followed by cantaloupe and finish it off with cottage cheese.